If you are a 4K TV owner, you were probably as excited as we were when the above trailer was first released. It unveiled a brand new and upgraded PS4 ready to tackle the challenges imposed by the ever-growing 4K display market. But Sony is known for releasing a lot of optional (yet convenient and useful) accessories to go with their consoles, and the PS4 Pro was no exception. Indeed, some were released exclusively for the Pro while some others are compatible with other versions of the PS4, or even PS3. Ultimately, whether the Pro is your first Playstation 4, your first console, or just merely the latest addition to your collection, this article will bring you the best PS4 Pro accessories, some of which you didn’t know you needed until you finally get your hands on them. If on the other hands, you have an XBOX One X, you should check out this guide instead. Still, some of these seem more like vanity products while others can provide a more wholesome PS4 experience. Without any further ado, let’s dive right into it! 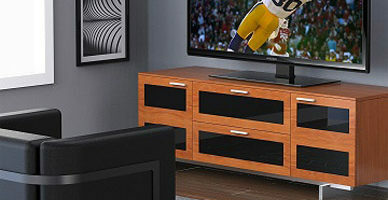 A charging station is an accessory designed with the sole goal of making the process of charging controllers more convenient. Not only can you charge multiple controllers at once, but it’s also much less of a hassle to simply pop the controller onto the charging station than bothering with USB cables after every gaming session. 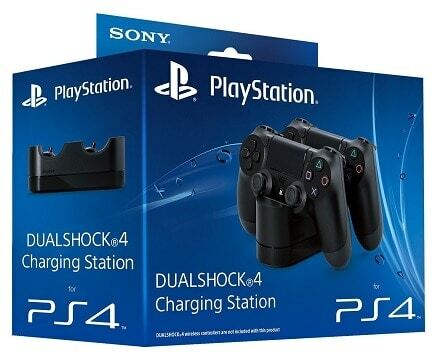 In this category, we will introduce you to the three best PS4 charging stations currently available! This is the official DualShock 4 Charging Station manufactured by Sony themselves, and this is evident both from the aesthetic choices and the sheer quality of the product’s build. The charging station’s matte black exterior blends perfectly with both the default black DualShock 4 and with the default PlayStation 4, be it a Slim, a Pro, or the original model. It can charge two controllers at any given time via the two extension ports, both of which were designed to be flexible and magnetized so as to make fitting a controller on them easier. Furthermore, it plugs into a power socket via its own AC adapter and does not take up any of your console’s USB ports. 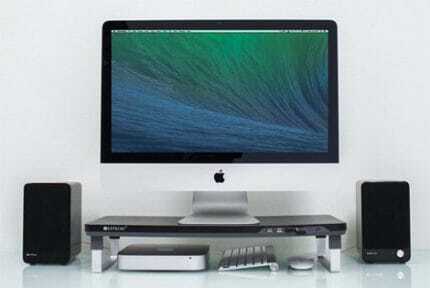 In the end, the only drawback of this charging station is that it is a bit more expensive than most of the third-party ones out there, but this higher price tag is wholly justified when you take into account the quality of the product. The next product is a 2-in-1 charging station which is also manufactured by Sony. 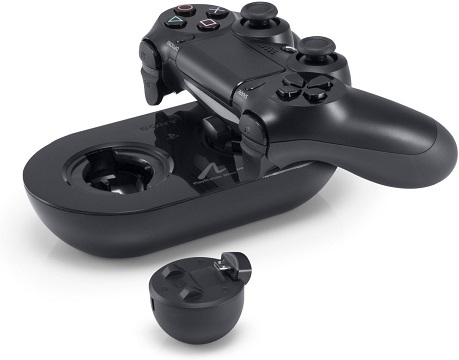 While it is primarily a Move controller charging station, it also comes with two adapters which allow a DualShock 4 to be connected and charged as well. The charging station itself is quite compact, albeit with more of a glossy black surface instead of the usual matte black. Move controllers are simply placed vertically into the sockets, while the DualShock 4 controllers are charged via the micro USB port featured on the adapters. And finally, it also relies on the included AC adapter for power. There are no glaring downsides to this charging station, apart from the fact that DualShock 4 controllers don’t feel as stable on it as they are on most other stations. This can be chalked up to the fact that it was simply never made for the DualShock 4 but for the Move controllers. And finally, we have another DualShock 4 charging station, but this time it is made by PowerA, not Sony themselves. However, it is still an officially licensed and branded product, so you can rest assured that you’re not dealing with any shady third-party chargers. Visually, it is quite a bit more conspicuous in its design than the other two charging stations mentioned here, which can be either a good or a bad thing depending on the user’s preferences. As for the functionality, it uses extension ports to charge the controllers, just like the official charging station. Now, the PowerA charging station’s main advantage is that it is definitely the most affordable charging station of the three, but not without some tradeoffs. Namely, it has a rather flimsy build and it is much harder to place the controllers on properly than it is with the official charging station. How can we talk about console accessories without mentioning the controllers themselves? 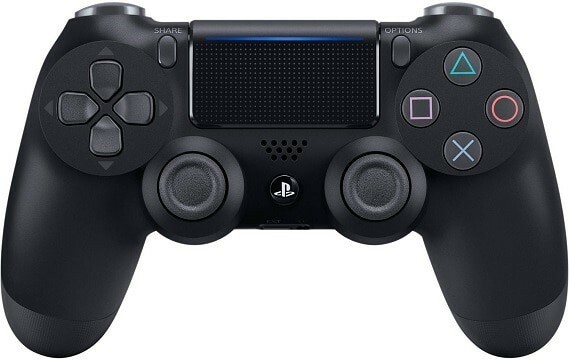 In this category, we will be looking at the revised and improved version of the DualShock 4 that was introduced with the PS4 Slim, as well as some additional controllers and controller accessories. There is no need to formally introduce the DualShock 4, as you are definitely already familiar with it. Instead, we will focus on what is different about the newer version of Sony’s recognizable controller, as the original PS4 owners may not be quite familiar with it. At first glance, the DualShock 4 V2 may not seem different at all – until you turn it on, that is. The most noticeable difference is the addition of a LED strip at the top of the touch-pad which allows you to see the light bar’s color more easily. The only other visual difference is that the hue of the buttons had been changed to a slightly lighter shade of grey. Finally, it also implements more durable thumb grips. All in all, not much is different about the new DualShock 4, except that it has fully eliminated the flaws that plagued the original iteration of the controller. So, keep that in mind if you’re buying an extra controller or need to replace your old one! Razer is a name that hardly needs any introduction. The company had quickly established themselves as a lead manufacturer of top-quality gaming accessories and peripherals, but also became known by their very high (and sometimes exorbitant) prices. The Razer Raiju controller is officially supported by the PlayStation 4 and it adds a number of features that are absent from the official DualShock 4. This includes four additional programmable buttons, four control buttons, textured thumb grips, and a more ergonomic design. It is also evident at first glance that the Raiju is built to resemble an Xbox One controller, a controller known for being extremely comfortable to use. 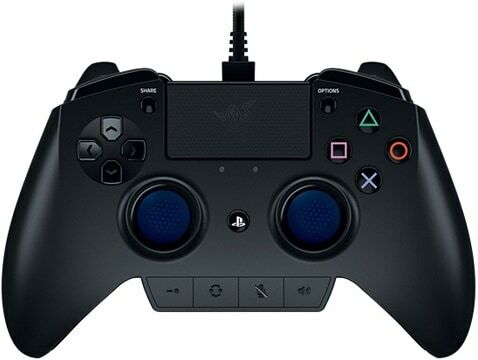 On the other hand, as with most (if not all) Razer products, the Raiju is very expensive, selling at roughly three times the price of the DualShock 4. Furthermore, it doesn’t support wireless connectivity and must be connected via a USB cable, which is quite unusual for a modern controller and especially one coming with such a high price tag. High-profile controllers with their plethora of features are great and all, but what about when you need a reliable and affordable alternative, perhaps with a bit of nostalgia to boot? That’s where the PlayStation 4 Mini Wired Gamepad made by Hori comes into play. This neat little gamepad is almost half the size of the DualShock 4 and is designed after the classic console controllers from the NES era. It also follows the classic black and blue color scheme that has come to represent the PlayStation 4 in general. Combine that with the solid build quality and just how responsive the controller is, and it immediately becomes worthy of consideration. But Hori’s gamepad is not without flaw. The biggest issue is that it won’t be fully compatible with all PS4 games due to the lack of certain features, namely the touchpad, light bar, and gyroscope. Apart from that, it also lacks the headphone jack, the speaker, and the vibration function. Moving onto the controller accessories, the first product here is the protective silicone case made by CHINFAI which also includes four pairs of textured thumb grips, with two of them being convex and the other two being concave. The case itself is well-made and designed to fit the DualShock 4 like a glove. It will stick firmly to the controller and will not cover any of the buttons or important parts such as the touchpad, the headphone jack, the speaker etc. It is also textured to provide a firmer grip and comes in several colors, including black, red, blue, as well as a special blue camo pattern. On the downside, while the thick silicon is great for protecting the controller from any potential impacts, it can also make it incompatible with some charging stations while it is on. Similarly, this thickness also makes the Share and Options buttons a tad difficult to reach. If you’re not interested in a protective case and only want some extra grip on your analogue sticks, then the KKONE Silicone Thumb Grips would be a great choice. They are designed to fit all types of mainstream controllers, so compatibility isn’t something to worry about if you’re not using an original DualShock 4. 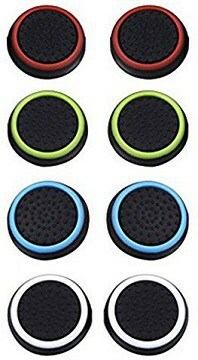 The package contains four pairs of thumb grips, all of which are the same, barring the color of the outer ring. They all have the identical pattern which is precisely what ensures a firmer grip on the stick and provides a more tactile feeling on top of that. 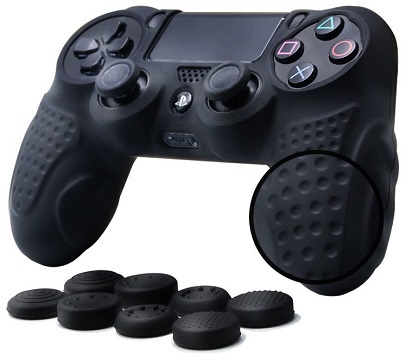 The only downside to these thumb grips is that they’re not exceptionally durable, especially if you are an avid gamer who enjoys frequent and long gaming sessions. However, seeing as they’re quite affordable and that they come in an eight-piece pack, this lack of durability is hardly a deal-breaker. At this point, we can be sure that VR is here to stay. VR capability is one of the key advantages that Sony has over its primary competitor, the Xbox One, and while every version of the console supports VR, the PS4 Pro is the one that can make the most of this technology. That said, we will devote this category to Sony’s official VR headset, as well as the two types of controllers that go with it and some useful accessories. When the PSVR first came out, it was far from the first of its kind. Where it stood out, however, was that it was the first VR headset which was affordable and mainstream-friendly that could still deliver a full-on VR gaming experience. The headset is very recognizable, with its black and white color scheme and the LED lights which, in tandem with the PS Camera, serve as a means of enhancing its motion sensing capabilities. As for the build quality, it conforms perfectly to the high standards that we have come to expect from Sony. Functionality-wise, the PSVR comes with a Full HD display utilizing OLED technology, supporting 90Hz and 120Hz refresh rates. Furthermore, it does not plug directly into the PS4 but rather, into the dedicated processor unit that comes with it. And, as mentioned above, every version of the PS4 is compatible with PSVR, although the PS4 Pro offers an enhanced VR experience. In the end, while it remains the best-value VR headset to this day, it is far from perfect. The biggest issue is not with the headset itself but due to the fact that it does not come with some accessories that would be considered indispensable: the PlayStation Camera and the PlayStation Move controllers. Other than that, PSVR performs admirably and far beyond what you’d expect in a VR headset that comes at such a relatively low price. The Move controllers are the foundation of PlayStation VR games. They were actually launched back in 2010, during the PS3 era, inspired by the Nintendo Wii motion controller. However, the Move controllers use two different means of tracking movement simultaneously – the built-in gyroscope and the PlayStation Camera. Similar to the PSVR headset, the camera tracks the light of the orb on top of each controller. The Move controllers are obviously a Sony product, which can be seen from the design, the details, and the overall build quality. As for their functionality, apart from their two-fold motion sensing capabilities, they also include the four face buttons on the front along with the Move and PS buttons, the Share and Options buttons on either side, and a single trigger on the underside. While the controllers are extremely precise and function flawlessly, the problem is once again the price tag. Not only are they very expensive, but their value is also dubious as it is entirely dependent on what games you intend to play. To make matters in the financial department even worse, you will also need to buy a PS Camera if you don’t already own one since it is not bundled with the controllers. VR is making first-person games more immersive than ever, so it was only natural for Sony to release a “gun” controller at some point. 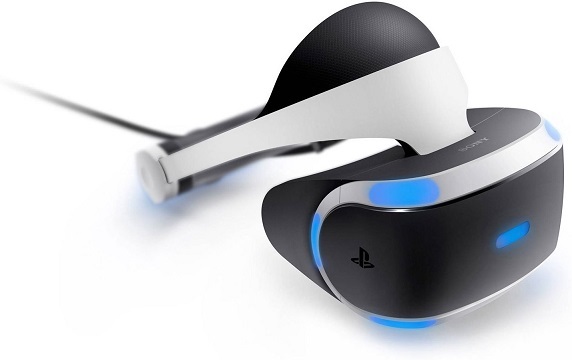 Visually, it is dominated by a blend of white and a slightly darker shade of gray which has come to represent the PSVR headset rather than the console itself. The Aim controller borrows the same technology from the Move controller but it is superior in that it has all the functionality of a regular controller: dual analogue sticks, a D-pad, etc. This is great news because it can essentially replace either an Aim or a DualShock 4 in any game. The actual sensor and camera-based aiming will, however, only work in games that support it. All in all, the Aim controller is big news for the VR crowd. The chief concern when it was originally launched was that it was only supported by the title it launched along with – Farpoint. The situation looks much better now, but the number of games that fully support it is still quite low and with some big titles missing. On top of that, not every game that supports the Aim controller integrates it as seamlessly as Farpoint does. When you invest in an expensive, futuristic piece of tech such as the PlayStation VR headset, you will want to be sure you can transport it safely and without much hassle. And what better solution is there than the RDS Industries-made and Sony-licensed PlayStation VR carry case? On the outside, the case is not exactly remarkable – it looks just like a regular bag with a carry handle and the recognizable PS buttons on the front. When you open it, however, you can see that it was designed precisely to accommodate not only the PSVR but also all of its accessories: the processor unit, the AC adapter, as well as a mesh pocket for the cables. 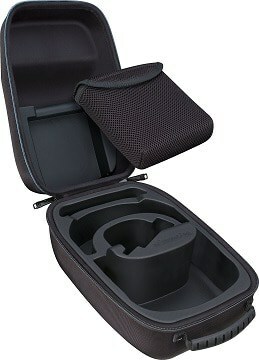 So, this RDS case allows you to transport your PSVR headset conveniently and safely thanks to the hard rubber interior, but what about the bad sides? Apart from not having enough space for the PS Camera, the case itself is without fault. However, the price might be a bit too high if you don’t actually plan on transporting the headset too often. Now, something called a “PSVR Showcase” might sound like a pointless vanity product at first, a means to effectively show off your amazing new VR headset. But as you can see from the picture, it is so much more. 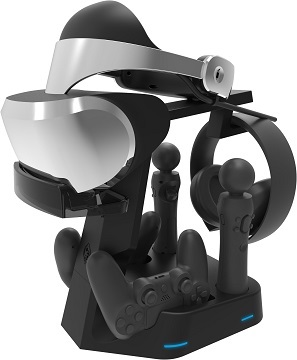 This so-called showcase made by Collective Minds is a means of both storing and charging a number of accessories: your PSVR headset, two DualShock 4 controllers, two Move controllers, and any compatible wireless headset that supports USB charging. And while it is not an official Sony product, the build quality, the matte black exterior, and the blue LED lights sure give it the appearance of one. The only downside is related specifically to the DualShock 4 chargers. Seeing as they are Micro USB chargers, it can be quite difficult to set a controller on properly, especially if the station is already crowded by other peripherals. And finally, we have several miscellaneous accessories that didn’t fit into any other category but also did not warrant a separate category of their own. These are the PS Camera, the official PS4 Pro vertical stand, and the PlayStation Gold Wireless headset. Mentioning the PlayStation Camera was inevitable, especially since a number of games rely on it and it is an absolutely crucial part of the PSVR experience. On top of that, it is also a superb camera for streaming and recording gameplay videos. Visually, it is a compact and sleek accessory that fits perfectly with the rest of the PlayStation 4 system. It can easily be placed wherever you wish, and it can also be tilted to achieve an optimal recording angle. The dual lenses are there to make depth perception possible, while the camera also supports facial recognition and voice command features. The only real problem is, as with some other accessories, not with the product itself but with the dubious value it presents. This is both because of the relatively high price tag and the fact that it is not used by many games in any meaningful way, making it appear as something of a gimmick akin to the Xbox Kinect. Furthermore, it also cannot be used with a PC or Mac as a webcam, which diminishes its value even further. PlayStation 3 was the first to introduce the concept of placing your console vertically, although only the very first PS3 model supported this without any additional accessories. Every subsequent PlayStation model required a special vertical stand so as to remain stable and have proper ventilation in that position. 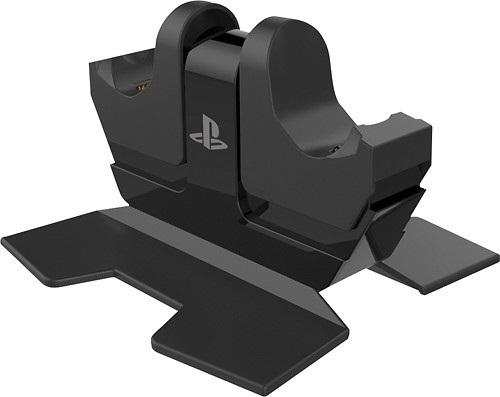 This official Sony vertical stand was designed to work with both the PS4 Pro and the PS4 Slim, but not with the original PS4. 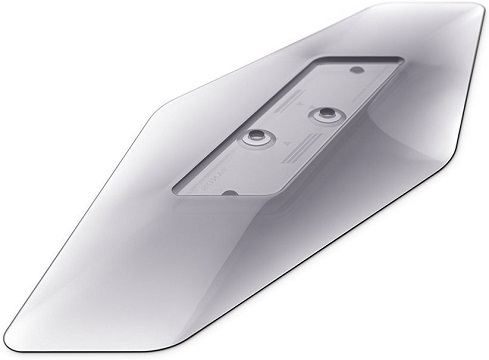 The stand itself is made of solid, transparent plastic, and it comes with two separate platforms for the Slim and Pro versions of the console. When installed, both consoles are extremely stable and the style of the stand ensures no airflow obstruction nor undesirable overheating. The only downside to this stand is that its glossy surface is a real scratch and dust magnet, even though this will hardly be visible when it is obscured by the console itself. Other than that, it is probably the best stand you can get since it was designed by Sony themselves and as such, it will not lead to any overheating, as mentioned in the previous paragraph. And finally, we have the official PlayStation 4 Gold wireless headset made by Sony. While it was somewhat overshadowed by the launch of the Platinum headset, the Gold variant remains more affordable and all-around reliable solution. 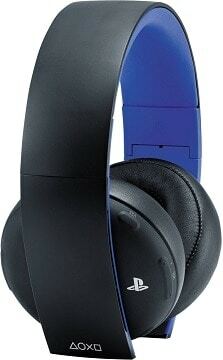 The headset comes with the signature black-and-blue PS4 color scheme, fold-in ear-cups, and comfortable leather covers. Moreover, it uses a USB wireless adapter instead of Bluetooth as a means of connectivity, which ensures better sound quality due to higher bandwidth. It also has a 3.5mm audio jack for wired connections and a micro USB port for charging. The sound quality itself is also remarkably good, even supporting virtual 7.1 surround on the PS4 and PS3 consoles. It is not without flaw, however. The biggest issue that some might face is that the virtual surround is, for some reason, not officially available on any devices other than the two consoles mentioned above. This just might be a deal-breaker for those looking for a quality virtual surround headset that they can use on all their gaming platforms.